Can Landlords Ban Medical Marijuana Without Getting Sued? The legalization of medical marijuana has created a controversy for landlords in states that have passed such laws. Michigan is one such state, and the Attorney General there, Bill Schuette, last week published a legal opinion regarding both the use and cultivation of medical marijuana in rental properties. In Mr. Schuette’s opinion, Michigan landlords have the right to ban both smoking marijuana, and growing it in rental properties. He points to a number of legal opinions, including some in other states, in reaching his conclusion. While some states have legalized medical marijuana use, the federal government has not. Pot is still considered a controlled substance. And that alone, according to Schuette, gives landlords the right to restrict it. But much of the confusion revolves around whether a landlord who restricts the use of medical marijuana in a rental property is discriminating against a person with a disability. Mr. Schuette argues this is not the case. Schuette quotes Michigan’s anti-discrimination laws, “an owner shall accommodate a person with a disability for purposes of . . . housing unless the [owner] demonstrates that the accommodation would impose an undue hardship.” These provisions, according to the State Attorney General, do not prohibit a property owner from adopting a policy declining to rent, lease, or provide accommodation to a person who engages or proposes to lease, or provide accommodation to a registered patient who engages or proposes to engage in the medical use of marijuana because the rejection would not be based on a patient’s disability, but rather on the patient’s decision to treat that condition with marijuana. It must be noted that this reasoning may appear inconsistent with recent HUD disability discrimination cases including claims filed against landlords who refused to bend a “no-pets” policy when a tenant with a disability chose to treat that disability using a companion animal. However, in a presentation developed last February, Mr. Schuette points to an exception in the Fair Housing Act for “current illegal use of or addiction to a controlled substance.” He adds that HUD also has supported the eviction of tenants who used marijuana for any reason in the rental property. One way to ban the use of marijuana may be to include a prohibition in the landlord’s no-smoking policy, according to Schuette. 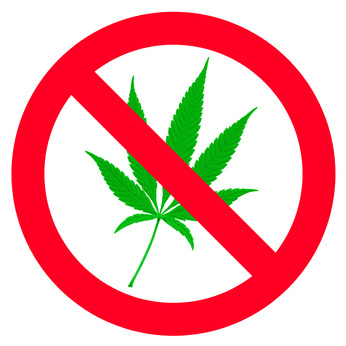 Typically public no-smoking bans do not apply to marijuana smoking, but often those laws do not protect the right to use marijuana either, leaving the matter to the discretion of the individual landlord. A landlord may want to ban pot smoking or the growing of marijuana plants within a property because of secondhand smoke concerns, and because the strong, distinctive odor may offend other people, including tenants. This, Schuette argues, means forcing a landlord to allow a person with a disability to smoke marijuana on the premises is not a “reasonable accommodation”, but rather an undue hardship. To bolster that argument, Schuette points to a Michigan case that held nothing in the state’s medical marijuana law requires an employer to accommodate the “ingestion of marijuana in any workplace or any employee working under the influence of marijuana.” Therefore, he says, nothing should prohibit a rental property owner from doing the same thing. A number of cases have supported a ban on medical marijuana use, including a case in Washington state that held that the Americans with Disabilities Act did not protect individuals who are currently engaged in the use of illegal drugs, regardless of whether state law allowed such use. According to Schuette, “a number of market-rate apartment owners” in Michigan have indicated that they will be or have already amended their leases to explicitly prohibit the use or smoking of marijuana in their buildings, including those certified by the state to use marijuana for medicinal reasons. To medical marijuana patients & caregivers. Can anyone tell me if the landlord is obligated to report the tenants if there is proof of smoking marijuana on the premises? Especially if the tenant does not have a medical card? Next post: When Are Application Fees Illegal?